Jellyfish are some of the most strange, interesting — and occasionally beautiful — animals currently living in the world. And they’ve been here for quite a long time — some species are, in many ways, unchanged from the way that there hundreds of millions of years ago. 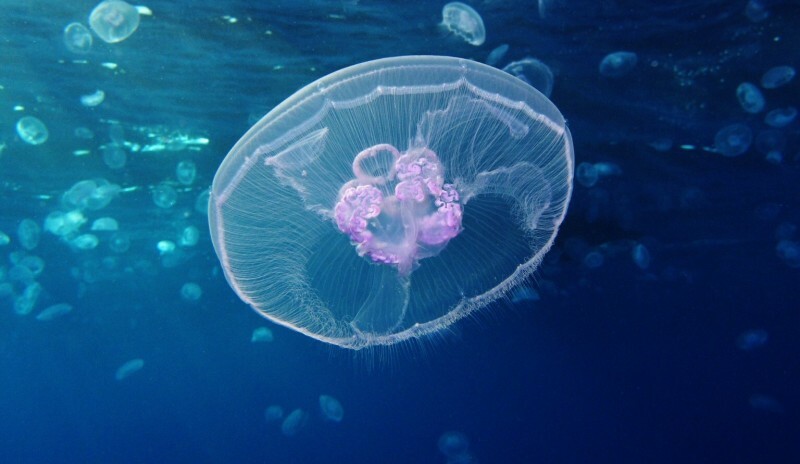 Owing to these facts, and — more importantly — their striking appearances I’ve created the list below compiling some of the most interesting species of jellyfish. Enjoy. Tima formosa are a type of jellyfish (in common language, not technically so) that are currently classified as being in the family Conica — and are actually a colonial species of marine hydrozoa. They are located in the order of Leptomedusae. They’re typically found in the northern parts of the Atlantic Ocean — and most especially in the upper epipelagic zone. They are known to sometimes occur in very large jellyfish blooms. Deepstaria enigmatica is a strange deep-sea jellyfish classified as being in the family Ulmaridae. It was only just recently (relatively) scientifically described — in 1967 by FS Russel. The name means something along the lines of “deep-staring enigma”. The movement of the animal is quite strange — and somewhat hypnotic — for lack of a better description I’d say that it looks like undulating waves in a sheet in the wind, but with a sort of living quality to it. 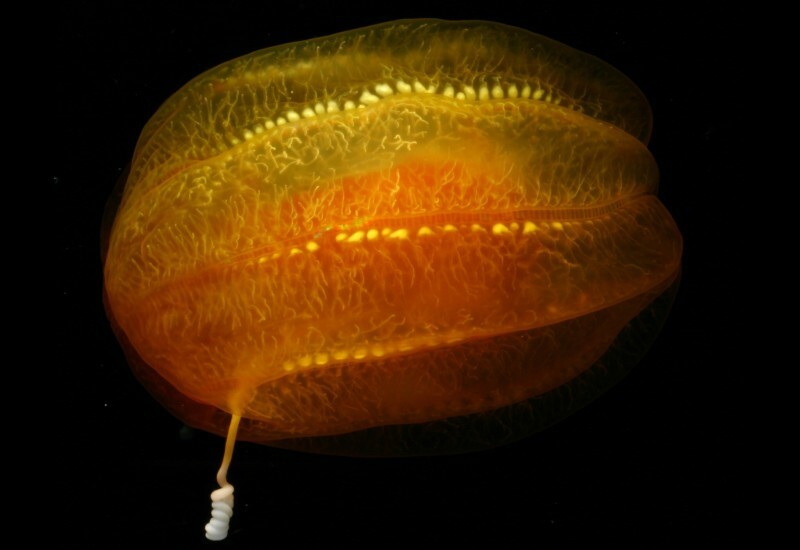 The bell (body) of the Deepstaria Enigmatica is fairly thin but can be be fairly large — around 2-feet across. The species is typically found onky in the water around Antarctic, or in the near-Antarctic seas — but they have occasionally been seen elsewhere. Living depths appear to be in 830-1830 meter/ range. 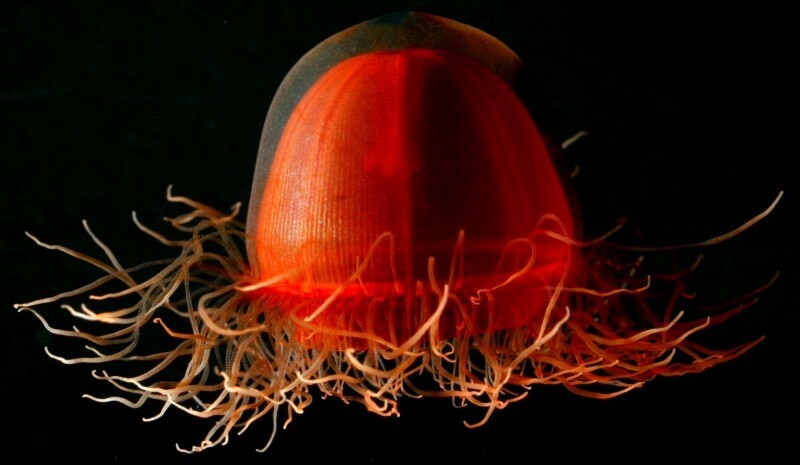 The lion’s mane jellyfish (Cyanea capillata) is probably one of the best known jellyfish in the world — largely owing to its large size. 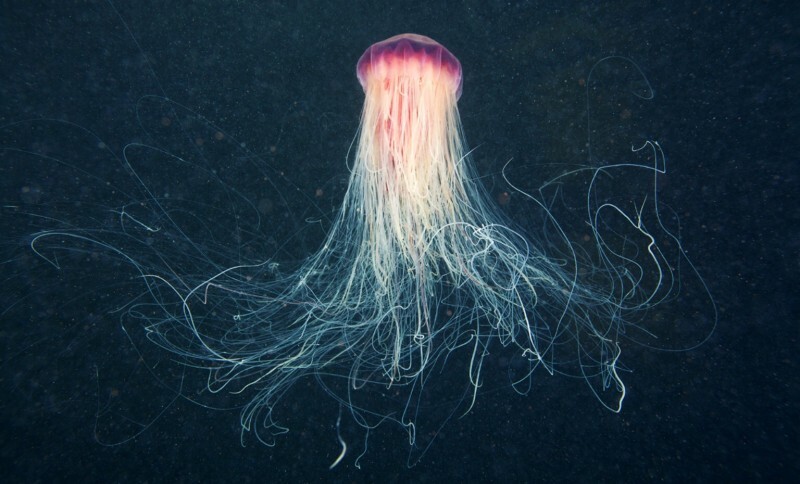 The species — also known as the hair jelly — is currently the largest known jellyfish species in the world. There are also populations that live in the area around Australia and New Zealand — it’s currently thought that these are of the same species, or a very closely related one. The biggest individual yet recorded scientifically had a body with a diameter of 7’6, and tentacles that stretched out for 120-feet — this individual was found washed up on the shore of Massachusetts Bay in 1870. Most populations typically grow to be quite large — with individuals regularly reaching 6’7 in body size. The rule on body size with this species is pretty much the same as with most other animals — the further north you go, the bigger they get. Tentacles typically grow to be more than 100-feet-long. That previously mentioned 120-foot individual is actually one of the longest known scientifically-documented animals of any type — being exceeded only by a bootlace worm (Lineus longissimus) that was found washed up on the shore of the Scottish coast back in 1864 — that bootlace worm was ~180 feet long. The Praya dubia (Giant Siphonophore) is a “jellyfish” that lives at great depths (700-1000 meters below) in the Atlantic Ocean and the Gulf of Mexico. 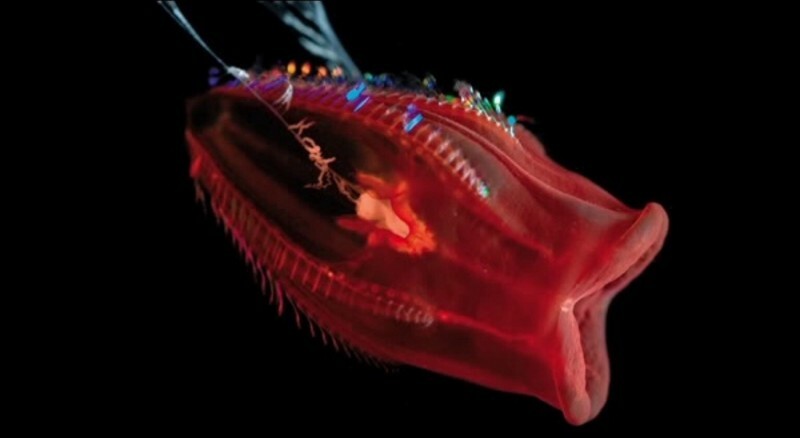 Said organism — a member of the Hydrozoa — isn’t actually an “animal” but instead a “colony made up of numerous small connected individuals, each with a specific function, such as feeding, attack, and defense”. It’s one of the largest/longest known organisms in the world — regularly possessing a body-length of around/over 120-130 feet. 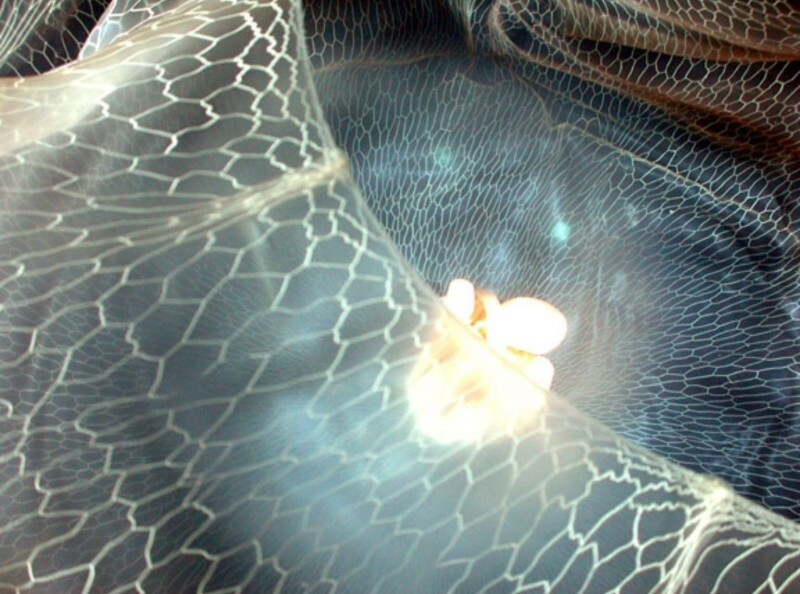 Praya dubia catches its prey by first attracting it with blue bioluminescent light, and then delivering a powerful sting from the bell-like cells that line its body. The sting is powerful enough to cause death often enough, but when it doesn’t paralysis is pretty much a given for its prey. Their bodies don’t do well with relatively low-pressures — such as those at surface-level — and as a result when they are brought to the surface they tend to explode/burst. So no real chance of ever seeing one of these in person — unless you’re a blue whale, a walrus, or a giant squid I guess. Or its prey, for that matter. The species has been known of since at least the 1800s. 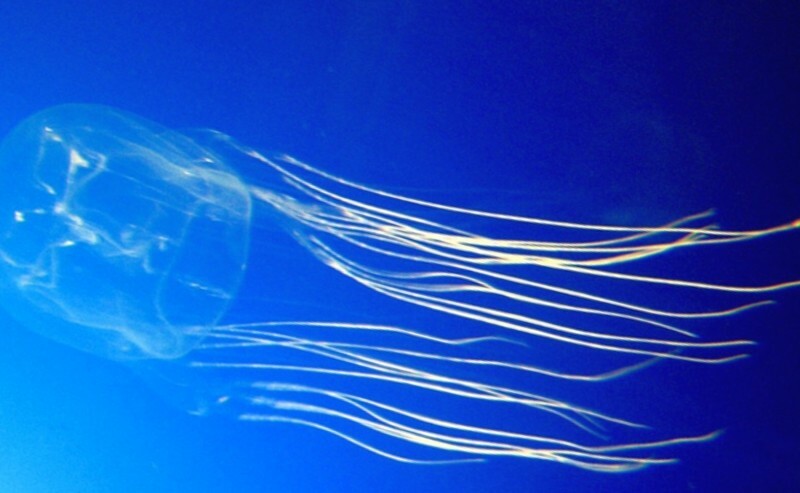 The Box jellyfish (class Cubozoa) are probably the most infamous jellyfish in the world — though I guess that depends a fair amount on where you live. Other than their incredibly potent venom they are perhaps most recognizable via their cube-shaped medusae — owing to the common-name. As far as venom goes, the most-potent species are Chironex fleckeri, Carukia barnesi and Malo kingi — all of which are amongst the most-venomous animals in the world. Stings are sometimes fatal for humans. Of these, Chironex fleckeri — the sea wasp — is probably the most infamous. Said species is found throughout the coastal waters of northern Australia and New Guinea all the way north to the Philippines + Vietnam. The species possesses tentacles up to 10 feet in length — all of which are covered in millions of cnidocytes which when touched release microscopic darts that deliver the powerful venom. If untreated sting victims can die in as quickly as just 3 minutes. To date, the species is known to have killed at least 63 people in Australia since 1884. Marrus orthocanna is a species of siphonophore — just as the previously mentioned praya dubia is. 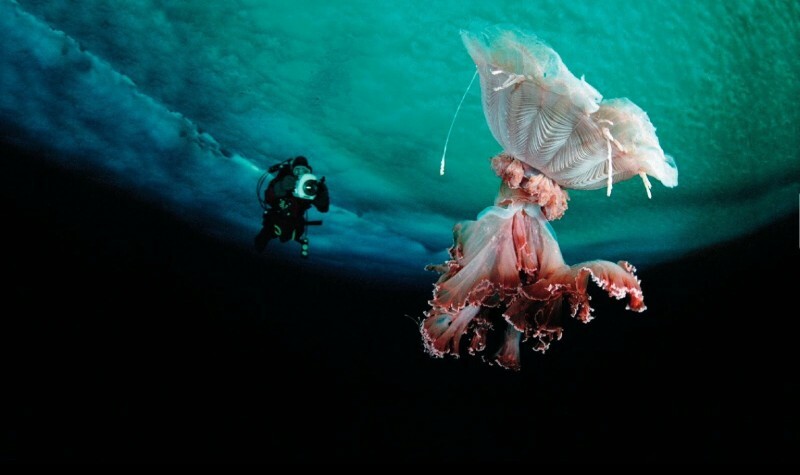 This species is typically found in the Arctic — but in other cold, deep waters elsewhere as well. Like other siphonophores, Marrus orthocanna is a colony composed of a number of specialized zooids linked together by a long stem. At the front is the pneumatophore, an orange-colored, gas-filled float. Behind this is the nectosome, a region where there are a number of translucent nectophores with red, unlooped radial canals. 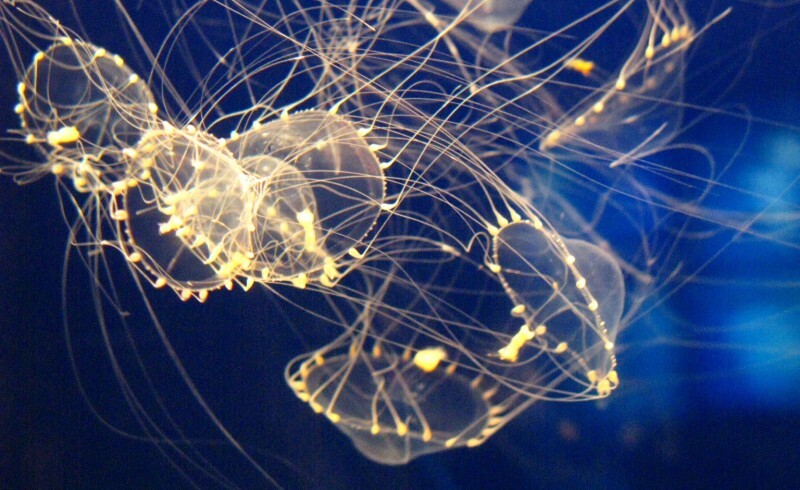 These are bell-shaped medusae specialized for locomotion. When they contract, water is expelled which causes the colony to move. Their contractions are coordinated which enables the animal to swim forwards, sidewards or backwards. The remaining region is the siphosome. Most of the zooids here are polyps, specialized for collecting food. They do this for the whole colony, spreading their single long tentacles in the water to snare prey. Other zooids in this region undertake digestion and assimilation of food items. Reproductive medusae are found among the polyps in the siphosome and also various other specialised zooids. The various forms are all arranged in a repeating pattern. The species can grow to be quite large — often growing to lengths of more than 10-feet. The organisms is a carnivore, and is thought to feed primarily on small crustaceans. Interestingly, the individuals that make up the colonial-animal are all born from a single egg. Crossota is a genus of jellyfish in the broader family of Rhopalonematidae. There are currently 5 species listed in the genus. The various species of the genus are distributed broadly across the world’s oceans. 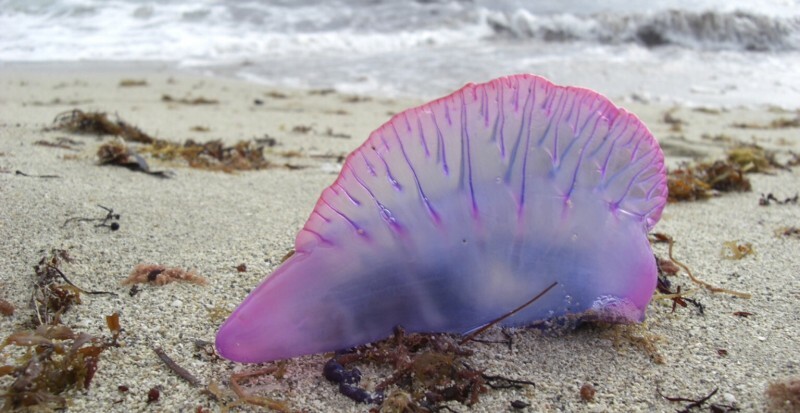 The Portuguese Man O’ War (Physalia physalis) is a marine cnidarian of the family Physaliidae. The species is well known for its powerful sting, and interesting appearance. It’s not actually a “jellyfish” in the scientific meaning of the word though — but instead a siphonophore, just as Marrus Orthocanna and Deepstaria Enigmatica are. The venom isn’t quite powerful enough to kill humans (ordinarily), but those with prior health-conditions may experience difficulties if stung. Also worth noting, if the venom manages to work its way to the lymph nodes then the pain becomes considerably, considerably worse.